Canadian company Sunrise Records have stepped in to save UK music chain HMV. 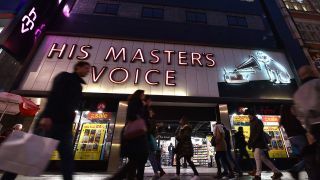 HMV called in administrators KPMG for the second time in six years in late December, citing "a tsunami of challenges" facing the company, including the move from traditional sales to digital. KPMG had been in discussions with Sunrise and Sports Direct owner Mike Ashley with the goal of saving stores and the jobs of approximately 2200 staff. Sunrise, who purchased HMV's Canadian operation in 2017, will bring 100 HMV stores out of administration, but 27 shops will close – which will result in 455 redundancies. Those set to close include HMV’s flagship store on London’s Oxford Street, while the Fopp stores in Bristol, Manchester, Oxford and Glasgow’s Byres Road will also be shut. Sunrise Records CEO Doug Putman says (via Music Week): “We are delighted to acquire the most iconic music and entertainment business in the UK and add nearly 1500 employees to our growing team. Putman told the BBC's Radio 4’s Today programme that while they would have liked to keep the other 27 stores open, it wasn’t feasible due to increasing rents. He added: “You can only lose so much money on those stores before you need to make a change. Unfortunately, rents are just very high at this time. While no price of the sale has been revealed, it was confirmed that the stores will retain the HMV name.